Grounding. Contact between a container and the ground point, usually by wire, to prevent generation of static electrical sparks. 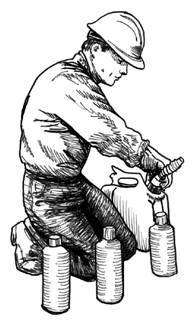 Fuel containers and chain saws must always be filled on the ground, not in a vehicle, to establish an adequate ground. Fueling of chain saws must also be done on the ground (not on a vehicle's tailgate), to ensure a positive ground is established. Guide Bar. Long, thin projection of the chain saw upon which the saw chain travels. Improper use of the bar results in kickbacks and saw cuts. It is the extreme top and bottom of the bar's tip that is sensitive. Gunning (or Sighting). Technique of aligning the handle bars and/or gunning mark with the desired felling direction. 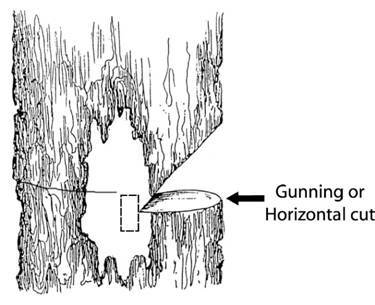 Since the handle bars and/or gunning mark are at a 90° angle to the bar, exact position of the undercut (face), in relation to the desired felling location can easily be established. Not all saw handle bars are designed to be used for gunning. Check your saw. Hands-on Training. Supervised training that demonstrates the application of knowledge and skill in a practical field exercise of proficiency. Hang-up. A situation in which a tree lodges in another and is prevented from falling to the ground. Hazard Tree. A standing tree that presents a hazard to people due to conditions such as, but not limited to, deterioration or physical damage to the root system, trunk, stem, or limbs, and/or the direction and lean of the tree. Head Lean. 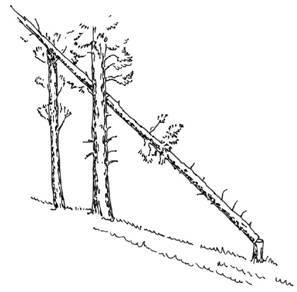 One of the two natural leaning forces found in most trees. Head lean is the most prominent outward slant or lean of a tree in reference to its base. Heartwood. 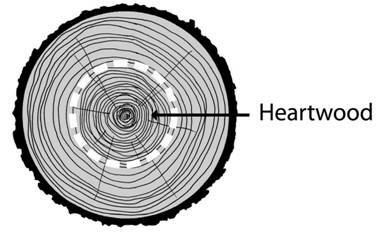 The inner layers of wood which, in the growing tree, have ceased to contain living cells. Hinge Wood/ Holding Wood. 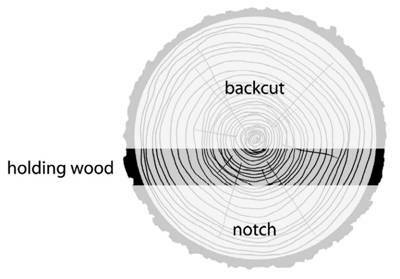 Section of wood located between the undercut (face, or notch) and the backcut. 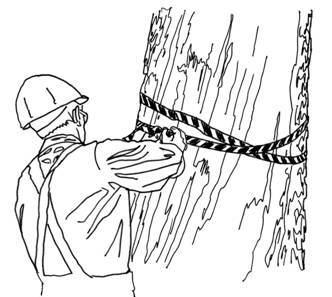 Its purpose is to prevent the tree from prematurely slipping from the stump until it has been committed to the undercut (face). It maintains the tree's alignment with the direction of fall. The holding wood must never be completely sawn off. Horizontal (Gunning) Undercut (face) Cut. First of the two cuts required to undercut (face) a tree. Its depth is minimally 1/3 the diameter of the tree and level. Humboldt Undercut (face). One of the types of undercuts (face cuts) commonly used to fall a tree. 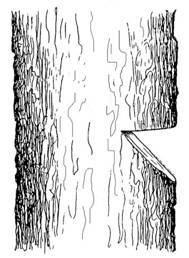 The 45° sloping cut (face) section is removed from the stump of the tree.